Time: 12-1PM Got Pain? : Topics: Health and nutrition expo with Chandra Vandry (RN). Speaker: Chandra has covered topics in past lectures on insomnia, migraines, arthritis, anxiety, diabetes, inflammation, all types of chronic pain, and much, much, more! Chandra has a nursing background in neurology, immunology, allergy and is a co-founder of Vandry Hope foundation, a research group on Chronic pain diseases, TBI, Legal blindness, PTSD with veterans and poverty. 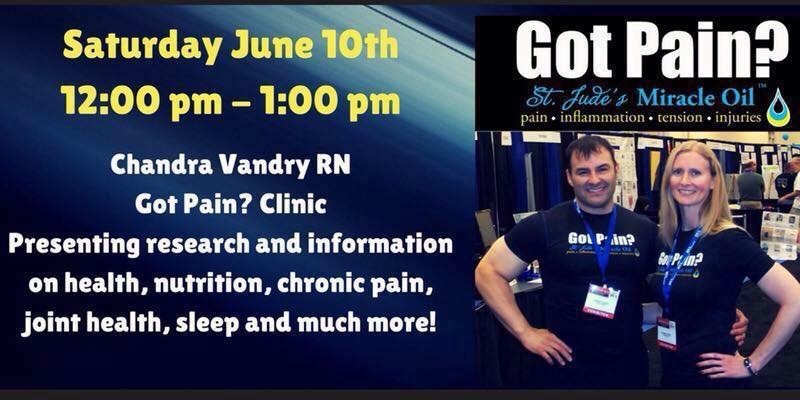 The clinic is free to the public, and a Got Pain? note pad will be handed out for notes. Chandra references her data from medical journals and her research. If you have any type of Chronic pain, Chandra is also co-inventor of the St. Jude’s Miracle oilTM product, and she will also bring the product.